Function: Kidney Ear Wires. 20g x Ear Nuts. Color: Silver. Due to the difference between different monitors, the picture may not reflect. Material: Stainless steel(Cadmium Free). Color: dull silver tone(not silver plated). Quantity: 20 PCs. Condition : 100% New. Part No. : B19157. 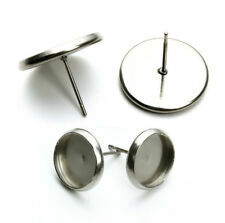 60 Pairs stainless steel blank round earring pads and butterfly safety backs. It is lightweight and easy to use. 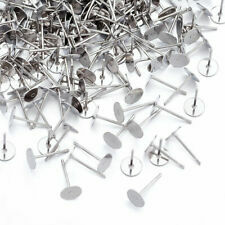 60 Pairs Ear Studs Pins. - Great DIY beautiful and elegant earrings with flatback rhinestone and crystal by using hot liquid glue;. 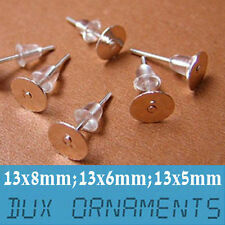 50pcs/lot 4.5x6.5mm Stainless Steel Earring Back Ear Wire For Jewelry Making Findings. Material：Stainless Steel. We will respond within 24 hours and give you a satisfying solution. Business scope: Wholesale fashion jewelry and Wholesale jewelry making accessories, such as various necklaces, various bracelets , various beads and various pendants，etc. Size: 18x15x0.7mm. 20g x Hook Ear Wires. Weight: 20g. Function: Hook Ear Wires. Material: Iron. Color: Silver. 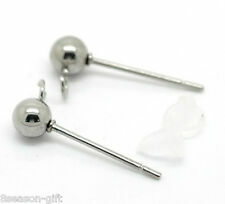 Stainless Steel Ear Wire Hooks Earring Findings Drop Silver Tone W/ Loop. We will respond within 24 hours and give you a satisfying solution. Beading Suppliers. Jewelry Findings. Hair Accessories & Findings. These secure and stylish earstuds will add right amount of flair to your earring designs. You can add sparking and elegant gemstone to the earring. Function: Kidney Ear Wires. x Ear Nuts. Color: Silver. Due to the difference between different monitors, the picture may not reflect. Jump Rings & Split Rings. Earring Findings. Stainless Steel Beads. Stainless Steel Findings. Bracelet Bases. Stainless Steel Pendants. Necklace Bases. Economical Ear Nuts, ideal for fashion jewelry earring designs. 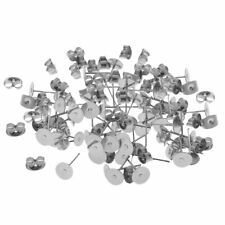 100 Pieces (50 Pairs)Stainless Steel Plated Earrings Pin Stud Flat Pad Pierce Craft. Material: stainless steel. Color: dark silver. I will do my best to resolve the problem until you feel satisfied. I don't accept cancellations. To fulfill your order. To communicate with you about your order. Material: 316l stainless steel, Nickel Free, Lead Free. Color : silver tone. Colour : Dull Silver Colour. Material:316L Stainless Steel. Model No: FEA01-11. Earnut 8g 50 Earnut. 304 Stainless Steel. Earrings Findings Original Color 304 Stainless Steel Earnuts. Feature: butterfly earnuts, made of good quality stainless steel material. 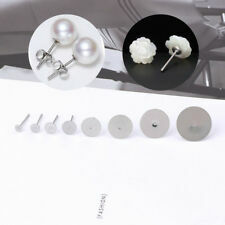 Economical earnuts, ideal for fashion jewelry earring designs. 304 Stainless Steel Earring Hooks. Size: about 21mm long, 22mm wide, hole: 2mm; pin: 0.7mm. Color :Dull Silver Tone. Material : Stainless Steel. Snap Button. Quantity : 10 PCs. 10pcs Chandelier Earring Findings, 3 Hole Small Stainless Steel Pendant Necklace Connector Supplies B162. Chandelier Earring Findings, 3 Hole Small Thin Pendant Necklace Connector Supplies. These connectors are small and thin stainless steel jewelry components. Feature: threader earring findings, long chain, oval link cable, with dangle hang hole loop, made of quality stainless steel material, nice for handmade threader earrings making. 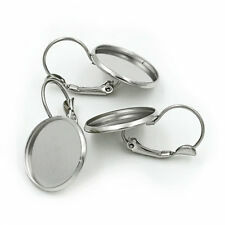 Size: about 90~94mm long, 1.2mm wide; oval link: 1.5x1.2x0.3mm; Ring: 3.5x0.5x2.5mm, pin: 0.8mm. Beading Suppliers. Item: 304 Stainless Steel Flat Round Blank Peg Ear Stud Components. Size: about 12mm long, 5mm wide, pin: 0.6mm. Color: Stainless Steel Color. We also can source many products for you. Material : Stainless steel(Cadmium Free). Color :dull silver tone(not silver plated). Snap Button. Quantity : 20 PCs. Condition : 100% New. Leverback Earwire. Feature: leverback earwire style, round shape, with dangle hang hole loop, made of good quality stainless steel material, nice for handmade hoop earring making. Kidney Earwire. Quality Clasp Findings.